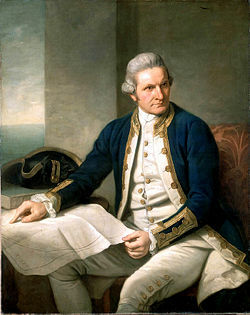 Captain James Cook, FRS (October 27, 1728 – February 14, 1779), was an English explorer, navigator and cartographer. He made three voyages to the Pacific Ocean, accurately charting many areas and recording several islands and coastlines on European maps for the first time. His most notable accomplishments were the British discovery and claiming of the east coast of Australia; the European discovery of the Hawaiian Islands; and the first recorded circumnavigation and mapping of Newfoundland and New Zealand. Cook died in Hawaii in a fracas with Hawaiians during his third exploratory voyage in the Pacific in 1779. One of the most significant legacies of his life would be the European colonization of Australia and New Zealand and of other islands in the South Pacific. James Cook was born in relatively humble circumstances at Marton in North Yorkshire, which today is within the town of Middlesbrough. Cook was one of five children born to a local woman and a Scottish immigrant farm laborer, Grace and James Sr. As a child, Cook moved with his family to Airey Holme farm at Great Ayton, where he was educated at the local school (now a museum), his studies financed by his father's employer. At 13 he began work with his father, who managed the farm. In 1745, when he was 16, Cook left home to be apprenticed in a grocery/haberdashery in the fishing village of Staithes. According to legend, Cook first felt the lure of the sea while gazing out the shop window. After a year and a half in Staithes, the shop's owner (Mr. Sanderson) found James unsuited to the trade. Mr. Sanderson took James to the nearby port town of Whitby and introduced him to John and Henry Walker. John and Henry were prominent local ship-owners and Quakers, and were in the coal trade business. Cook was taken on as a merchant navy apprentice in their small fleet of vessels, plying coal along the English coast. His first assignment was aboard the collier Freelove, and he spent several years on this, and various other coasters sailing between the Tyne and London. For this new apprenticeship, Cook applied himself to the study of algebra, trigonometry, navigation, and astronomy, skills he would need one day to command his own ship. His three-year apprenticeship completed, Cook began working on trading ships in the Baltic Sea. He soon progressed through the merchant navy ranks, starting with his 1752 promotion to Mate (officer in charge of navigation) aboard the collier brig Friendship. In 1755 he was offered command of this vessel, but within the month he volunteered for service in the British Royal Navy. In 1755, the Kingdom of Great Britain was re-arming for what was to become the Seven Years' War. Cook saw that his career could advance more quickly in military service. However, this required starting over in the naval hierarchy, and on June 17, he began as able seaman aboard HMS Eagle under the command of Captain Hugh Palliser. He was very quickly promoted to Master's Mate. Cook married Elizabeth Batts, the daughter of one of his mentors, on December 21, 1762. The couple would eventually have six children: James (1763-1794), Nathaniel (1764-1781), Elizabeth (1767-1771), Joseph (1768-1768), George (1772-1772), and Hugh (1776-1793). 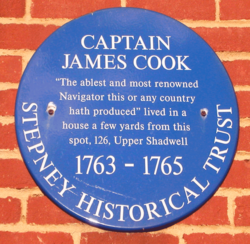 When not at sea, James Cook settled in the East End of London. He attended St. Paul's Church, Shadwell, where his son James was baptized. During the Seven Years' War, he participated in the siege of Quebec City before the Battle of the Plains of Abraham in 1759. He showed a talent for surveying and cartography and was responsible for mapping much of the entrance to the Saint Lawrence River during the siege, allowing General Wolfe to make his famous stealth attack on the Plains of Abraham. 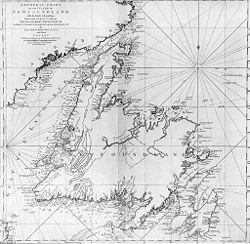 Cook's surveying skills were put to good use in the 1760s, mapping the jagged coast of Newfoundland. Cook surveyed the northwest stretch in 1763 and 1764, the south coast between the Burin Peninsula and Cape Ray in 1765 and 1766, and the west coast in 1767. 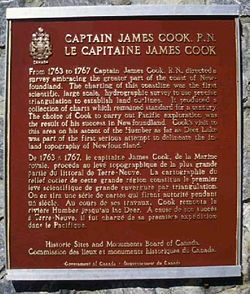 Cook’s five seasons in Newfoundland produced the first large-scale and accurate maps of the island’s coasts; they also gave Cook his mastery of practical surveying, achieved under often adverse conditions, and brought him to the attention of the Admiralty and Royal Society at a crucial moment both in his personal career and in the direction of British overseas discovery. Cook's huge achievements can be attributed to a combination of excellent seamanship, his superior surveying and cartographic skills, courage in exploring dangerous locations to confirm the facts (e.g. dipping into the Antarctic circle repeatedly and exploring around the Great Barrier Reef), ability to lead men in adverse conditions, and boldness both with regard to the extent of his explorations and his willingness to exceed the instructions given to him by the Admiralty. In 1766, the Royal Society hired Cook to travel to the Pacific Ocean to observe and record a transit of Venus across the Sun. Cook was commissioned as a Lieutenant and given command of HM Bark Endeavour. He sailed from England in 1768, rounded Cape Horn and continued westward across the Pacific to arrive at Tahiti on April 13, 1769, where the observations were to be made. The transit was scheduled to occur on June 3, and in the meantime he commissioned the building of a small fort and observatory. Disappointingly, the separate measurements of Green, Cook, and Solander varied more than the anticipated margin of error. Their instrumentation was adequate by the standards of the time, but the resolution still could not eliminate the errors. When their results were later compared to those of the other observations of the same event made elsewhere for the exercise, the net result was not as conclusive or accurate as had been hoped. Once the observations were completed, Cook then departed in order to execute the second purpose of his voyage: namely, to search the south Pacific for signs of the postulated southern continent of Terra Australis, acting on additional instructions from the Admiralty. The Royal Society, and especially Alexander Dalrymple, believed that it must exist, however Cook had his own personal doubts on the subject. With the help of a Tahitian named Tupaia, who had extensive knowledge of Pacific geography, Cook managed to reach New Zealand on October 6, 1769, becoming only the second European in history to do so (after Abel Tasman more than a century earlier, in 1642. Cook mapped the complete New Zealand coastline, making only some minor errors (such as calling Banks Peninsula an island, and thinking Stewart Island/Rakiura was part of the South Island). He also discovered Cook Strait, which separates the North Island from the South Island, and which Tasman had not seen. the Southermost Point of land we had in sight which bore from us W1/4S I judged to lay in the Latitude of 38°..0' S° and in the Longitude of 211°..07' W t from the Meridion of Greenwich. I have named it Point Hicks, because Leuit t Hicks was the first who discover'd this land. The ship's log recorded that land was sighted at 6 a.m. Thursday April 19, 1770. Cook's log used the nautical date, which, during the eighteenth century, assigned the same date to all ship's events from noon-to-noon, first p.m. and then a.m. That nautical date began twelve hours before the midnight beginning of the like-named civil date. Furthermore, Cook did not adjust his nautical date to account for circumnavigation of the globe until he had traveled a full 360 degrees relative to the longitude of his home British port, either toward the east or west. Because he traveled west on his first voyage, this ante meridian nautical date was the morning of a civil date fourteen hours slow relative to his home port (port−14h). Because the southeast coast of Australia is now regarded as being ten hours fast relative to Britain (port+10h), 24 hours later, that date is now called Friday, April 20. The landmark of this sighting is generally reckoned to be a point lying about half-way between the present-day towns of Orbost and Mallacoota on the southeastern coast of the state of Victoria. A later survey done in 1843 ignored or overlooked Cook's earlier naming of the point, giving it the name Cape Everard. On the 200th anniversary of the sighting, the name was officially changed back to Point Hicks. The Endeavour continued northwards along the coastline, keeping the land in sight and Cook charting and naming landmarks as he went. A little over a week later, they came across an extensive but shallow inlet, and upon entering it moored off a low headland fronted by sand dunes. It was here, on April 29, that Cook and crew made their first landfall on the continent, at a place now known as Kurnell. This date does not need adjustment because it occurred during the afternoon (p.m.) on April 29 in the ship's log, but was the afternoon of the civil date of April 28, 14 hours west of port, which is now a civil date 10 hours east of port, 24 hours later, hence a modern civil date of April 29. At first Cook bestowed the name Stingaree (Stingray) Bay to the inlet after the many such creatures found there; this was later changed to Botanist Bay and finally Botany Bay after the unique specimens retrieved by the botanists Joseph Banks, Daniel Solander, and Herman Spöring. This first landing site was later to be promoted (particularly by Joseph Banks) as a suitable candidate for situating a settlement and British colonial outpost. However, almost eighteen years after this first landing, when Captain Arthur Phillip and the First Fleet arrived in early 1788 to establish an outpost and penal colony, they found that the bay and surrounds did not live up to the promising picture which had been painted. Instead, Phillip shortly thereafter gave orders to relocate to a harbor a few kilometers to the north, which Cook had named Port Jackson but had not further explored. It was in this harbor at a place Phillip named Sydney Cove that the settlement of Sydney was established. The settlement was for some time afterwards still referred to generally as Botany Bay. The expedition's scientific members commenced the first European scientific documentation of Australian fauna and flora. At Cook's original landing, contact was made with the local Australian Aborigine inhabitants. As the ships sailed into the harbor, they noticed aborigines on both of the headlands. At about 2 p.m. they put the anchor down near a group of six to eight huts. Two aborigines, a younger and an older man, came down to the boat. They ignored gifts from Cook. A musket was fired over their heads, which wounded the older man slightly, and he ran towards the huts. He came back with other men and threw spears at Cook's men, although they did no harm. They were chased off after two more rounds were fired. The adults had left, but Cook found several Aboriginal children in the huts, and left some beads with them as a gesture of friendship. Cook continued northwards, charting along the coastline. A mishap occurred when the HM Bark Endeavour ran aground on a shoal of the Great Barrier Reef, on June 11, 1770. The ship was seriously damaged and his voyage was delayed almost seven weeks while repairs were carried out on the beach (near the docks of modern Cooktown, at the mouth of the Endeavour River). While there, Joseph Banks, Herman Spöring and Daniel Solander made their first major collections of Australian flora. The crew's encounters with the local Aboriginal people were mainly peaceable; from the group encountered here the name "kangaroo" was to be entered into the English language, coming from the local Guugu Yimidhirr word for a kind of Grey Kangaroo, gangurru (IPA: /ɡaŋuru/). Once repairs were complete the voyage continued, eventually passing by the northern-most point of Cape York Peninsula and then sailing through Torres Strait between Australia and New Guinea, earlier navigated by Luis Vaez de Torres in 1604. At that point in the voyage, Cook had lost not a single man to scurvy, a remarkable and practically unheard-of achievement in eighteenth century long-distance sea-faring. Adhering to Royal Navy policy introduced in 1747, Cook persuaded his men to eat foods such as citrus fruits and sauerkraut. Sauerkraut is a good source of vitamin C and was apparently new to a shipboard diet. At that time it was known that poor diet caused scurvy but not specifically that a Vitamin C deficiency was the culprit. The means by which he persuaded his crew, are illustrative of Cook's leadership qualities. Sailors of the day were notoriously against innovation, and at first the men would not eat the sauerkraut. Cook used a little trick, one he'd never known to fail. He ordered it served to himself and the officers, and left an option for crew who wanted some. Within a week of seeing their superiors set a value on it the demand was so great, a ration had to be instituted. Cook then visited the island of Savu, staying for three days before continuing on to Batavia, the capital of the Dutch East Indies, to put in for repairs. Batavia was known for its outbreaks of malaria, and before they returned home in 1771, many in Cook's crew would succumb to the disease and other ailments such as dysentery, including the Tahitian Tupaia, Banks's Finnish secretary and a fellow scientist Herman Spöring, astronomer Charles Green, and the illustrator Sydney Parkinson. Cook had named the Spöring Island on the coast of New Zealand to honor Herman Spöring and his work on the voyage. The Endeavour, his ship on this first voyage, would later lend its name to the Space Shuttle Endeavour, as well as the Endeavour River. Cook's journals were published upon his return, and he became something of a hero among the scientific community. Among the general public, however, the aristocratic botanist Joseph Banks was a bigger hero. Banks even attempted to take command of Cook's second voyage, but removed himself from the voyage before it began. 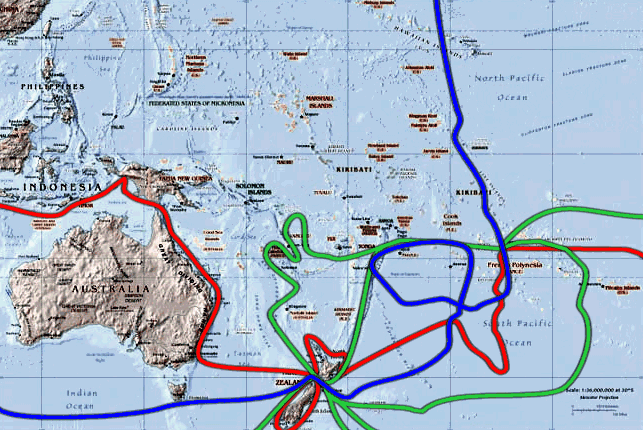 The south-Pacific routes of Captain James Cook's voyages. The first voyage is shown in red, second voyage in green, third voyage in blue. Shortly after his return, Cook was promoted from Lieutenant to Commander (correctly "Master and Commander"). Then once again he was commissioned by the Royal Society to search for the mythical Terra Australis. On his first voyage, Cook had demonstrated by circumnavigating New Zealand that it was not attached to a larger landmass to the south; and although charting almost the entire eastern coastline of Australia had shown it to be continental in size, the Terra Australis being sought was supposed to lie further to the south. Despite this evidence to the contrary Dalrymple and others of the Royal Society still believed that this massive southern continent should exist. Cook commanded HMS Resolution on this voyage, while Tobias Furneaux commanded its companion ship, HMS Adventure. Cook's expedition circumnavigated the globe at a very high southern latitude, becoming one of the first to cross the Antarctic Circle on January 17, 1773, reaching 71°10' south. He also discovered South Georgia and the South Sandwich Islands. In the Antarctic fog, the Resolution and Adventure became separated. Furneaux made his way to New Zealand, where he lost some of his men following a fight with the Māori, and eventually sailed back to Britain, while Cook continued to explore the Antarctic. Cook almost discovered the mainland of Antarctica, but turned back north towards Tahiti to resupply his ship. He then resumed his southward course in a second fruitless attempt to find the supposed continent. On this leg of the voyage he brought with him a young Tahitian named Omai, who proved to be somewhat less knowledgeable about the Pacific than Tupaia had been on the first voyage. On his return voyage, in 1774, he landed at the Friendly Islands, Easter Island, Norfolk Island, and Vanuatu. His reports upon his return home put to rest the popular myth of Terra Australis. Another accomplishment of the second voyage was the successful employment of the K1 chronometer which facilitated accurate measurement of longitude. Upon his return, Cook was promoted to the naval rank of Captain and given an honorary retirement from the Royal Navy (as an officer in the Greenwich Hospital). But Cook could not be kept away from the sea. A third voyage was planned to find the Northwest Passage. Cook would travel to the Pacific and hoped to travel east to the Atlantic, while a simultaneous voyage would travel the opposite way. On his last voyage, Cook once again commanded HMS Resolution, while Captain Charles Clerke commanded HMS Discovery. Ostensibly the voyage was planned to return Omai to Tahiti; this is what the general public believed, as he had become a favorite curiosity in London. After returning Omai, Cook traveled north and in 1778 became the first European to visit the Hawaiian Islands, which he named the "Sandwich Islands" after the 4th Earl of Sandwich, the acting First Lord of the Admiralty. There is some discussion by recent historians that Cook's arrival on what is now the "Big Island" of Hawaii coincided by quirk of fate with a season of worship for the Polynesian god Lono. Indeed the form of Cook's ship HMS Resolution (more particularly the mast formation, sails and rigging) resembled certain significant artifacts that formed part of the season of worship. Similarly, Cook's clockwise route around the island before making landfall resembled the processions that took place in a clockwise direction around the island during the Lono festivals. For these reasons the arrival, it is thought, led to Cook's (and to a limited extent, his crew's) initial deification by the natives, who treated him with great reverence as a possible incarnation of Lono himself. From there, he traveled east to explore the west coast of North America, eventually landing near the First Nations village at Yuquot in Nootka Sound on Vancouver Island, although he unknowingly sailed past the Strait of Juan de Fuca. He explored and mapped the coast from California all the way to the Bering Strait, on the way discovering what came to be known as Cook Inlet in Alaska. The Bering Strait proved to be impassable, although he made several attempts to sail through it. Cook became increasingly frustrated on this voyage, and perhaps began to suffer from a stomach ailment; it is speculated that this led to irrational behavior towards his crew, such as forcing them to eat walrus meat—which they found inedible (It has also been suggested that Cook had been exhibiting irrational behavior since early in the voyage). Cook returned to Hawaii in 1779. On February 14, at Kealakekua Bay, some Hawaiians stole one of Cook's small boats. Normally, as thefts were quite common in Tahiti and the other islands, he would have taken hostages until the stolen articles were returned. Indeed, he planned to take hostage the Chief of Hawaii, Kalaniopu'u. However, his stomach ailment and increasingly irrational behavior led to an altercation with a large crowd of Hawaiians gathered on the beach when Cook went ashore to retrieve the goods. The villagers, angered by his strict insistence on getting back a pair of tongs, and hearing that another British search party had killed one of their chiefs, began to attack with spears and stones. In the ensuing skirmish, shots were fired at the Hawaiians but their woven war shields protected them, and Cook's men had to retreat to the beach. As Cook turned his back to help launch the boats, he was struck on the head by the villagers and then stabbed to death as he fell on his face in the surf. The Hawaiians dragged his body away. It is thought that Cook's return to Hawaii outside the season of worship for Lono (Makahiki)—which was synonymous with "peace"—and thus in the season of "war" (dedicated to Kū, god of war) may have upset the equilibrium and fostered an atmosphere of resentment and aggression from the local population. Coupled with a jaded grasp of native diplomacy and a burgeoning but limited understanding of local politics, Cook may have inadvertently contributed to the tensions that ultimately conspired in his own demise. The esteem in which the Captain was nevertheless held by the natives resulted in his body being retained by their chiefs and elders (possibly for partial human consumption, though this assertion remains contentious) and the flesh cut and roasted from his bones. Indeed some of Cook's remains, disclosing some corroborating evidence to this effect, were eventually returned to the British for a formal burial at sea following an appeal by the crew. Clerke took over the expedition and made a final attempt to pass through the Bering Strait. The Resolution and Discovery finally returned home in 1780. Cook's account of his voyage was completed by Captain James King. A number of the junior officers who served under Cook went on to distinctive accomplishments of their own. William Bligh, Cook's sailing master, was given command of HMS Bounty in 1787 to sail to Tahiti and return with breadfruit. William Bligh is most known for the mutiny of his crew which resulted in him being set adrift in 1789. (See: Mutiny on the Bounty). He later became governor of New South Wales, where he was also the subject of another mutiny—the only successful armed takeover of an Australian colonial government. George Vancouver, one of Cook's midshipmen, later led a voyage of exploration to the Pacific Coast of North America from 1791 to 1794. George Dixon sailed under Cook on his third expedition, and later commanded an expedition of his own. James Cook's 11 years sailing around the Pacific Ocean contributed much to European knowledge of the area. Several islands such as Sandwich Islands (Hawaii) were encountered for the first time by Europeans, and his more accurate navigational charting of large areas of the Pacific was a major achievement. To create accurate maps, latitude and longitude need to be known. Navigators had been able to work out latitude accurately for centuries by measuring the angle of the sun or a star above the horizon with a sextant. But longitude was more difficult to measure accurately because it requires precise knowledge of the time difference between points on the surface of the earth. Earth turns a full 360 degrees relative to the Sun each day. This converts to 15 degrees every hour, and therefore 1 degree every 4 minutes. Thus longitude corresponds to time. Cook obtained accurate longitude measurements during his first voyage due to his navigational skills, the help of astronomer Charles Green and by using the newly published Nautical Almanac tables, via the lunar distance method—measuring the angular distance from the moon to either the sun during daytime or one of eight bright stars during nighttime to determine the time at the Royal Observatory, Greenwich and comparing that to his local time determined via the altitude of the sun, moon, or stars. On his second voyage Cook used the K1 chronometer made by Larcum Kendal, which was the shape of a large pocket watch, 13 cm (5 inches) in diameter. It was a copy of the H4 clock made by John Harrison, which proved to be the first to keep accurate time at sea when used on the ship Deptford's journey to Jamaica, 1761-1762. There were several artists on the first voyage. Sydney Parkinson was involved in many of the drawings, completing 264 drawings before his death near the end of the voyage. They were of immense scientific value to British botanists. Cook's second expedition included the artist William Hodges, who produced notable landscape paintings of Tahiti, Easter Island, and other locations. Cook was accompanied by many scientists, whose observations and discoveries added to the importance of the voyages. Joseph Banks, a botanist, went on the first voyage along with fellow botanist Daniel Solander from Sweden. Between them, they collected over 3,000 plant species. Banks became one of the strongest promoters of the settlement of Australia by the British, based on his own personal observations. Ever the explorer, Cook was the first European to have extensive contact with various people of the Pacific. He sailed to many islands near the Philippines and even to smaller, more remote islands in the South Pacific. He correctly concluded there was a relationship among all the people in the Pacific, despite their being separated by thousands of miles of ocean (see Malayo-Polynesian languages). The first post-secondary education institution in North Queensland, Australia was named after the discoverer, with James Cook University opening in Townsville in 1970. Numerous other institutions, landmarks and place names reflect the importance of Cook's contribution to knowledge of geography. James Cook University Hospital, a teaching hospital in Marton, Middlesbrough was also named after the local explorer. ↑ Founding Documents, Additional Instructions. Retrieved June 13, 2007. ↑ Aurthur R. Hinks, "Nautical time and civil date," The Geographical Journal, 86 (1935): 153-157. ↑ Etext Library, Captain Cook's Journal Chapter Two; April 13, 1769. Retrieved June 13, 2007. ↑ National Maritime Museum, John Harrison and the Longitude problem. Retrieved June 13, 2007. Obeyesekere, Gananath. The Apotheosis of Captain Cook: European Mythmaking in the Pacific. Princeton, NJ: Princeton University Press; Honolulu, Hawaiʻi : Bishop Museum Press, c1997. ISBN 0691057524. Sydney Daily Telegraph. Captain Cook: His Artists—His Voyages; The Sydney Daily Telegraph Portfolio of Original Works by Artists who sailed with Captain Cook. Sydney: Australian Consolidated Press, 1970. Cook, James (1728–1779)—Australian Dictionary of Biography Online entry. New Endeavour - a recent revisit of Captain Cook's first Pacific voyage. Biography - Dictionary of Canadian Biography Online. JamesCook: Celebrated North Country Navigator. The Endeavour journal, as kept by James Cook—digitized and held by the National Library of Australia. Captain James Cook: The World's Explorer. Retrieved June 13, 2007. Works by James Cook. Project Gutenberg. Find-A-Grave profile for James Cook. This page was last modified on 16 March 2018, at 15:50.